LOS ANGELES, CA--(Marketwired - Mar 3, 2017) - The California Hispanic Chambers of Commerce (CHCC), the premier organization promoting the development of Hispanic entrepreneurs and emerging Latino businesses in California, hosts the 2017 Economic Summit on March 3, 2017 at The LA Hotel Downtown, from 12:00 to 5:00 pm. LA Mayor Eric Garcetti's team will join entrepreneurs and business leaders from throughout California. Building a Stronger California is the theme of the 5th Annual Economic Summit, a forum to engage small business leaders, community partners, and elected officials to create comprehensive and feasible solutions. "Recent economic and political shifts are impacting our communities and creating barriers for Latino owned businesses. 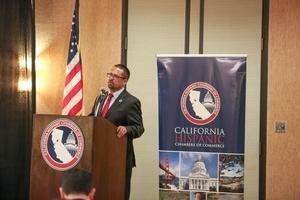 Latino entrepreneurs are California's backbone, and the engine driving economic growth and job creation. Through advocacy, education and economic development, the CHCC provides our business community with the resources to thrive in an uncertain climate", shares Frank Montes, Chairman, California Hispanic Chambers of Commerce. "L.A.'s economy is surging, and the California Hispanic Chambers of Commerce Annual Summit brings together men and women who are working hard every day to bring greater economic opportunity to our communities," said Mayor Eric Garcetti. "We're creating jobs at a historic pace and attracting new investment -- and the Chamber embodies the spirit of innovation and creativity that make our city and state the best place in the world to turn a dream into a business." This year's CHCC Economic Summit will include the presentation and analysis of the Stanford University report on the State of Latino Entrepreneurship. The average five year growth rate of Latino owned businesses remains double or triple the national average, these businesses are poised to expand the US economy. Even if the number of Latino owned businesses remained the same, the impact in the increase of sales would top $1.3 trillion dollars. The lack of money and out of control expenses, are a small business owner's worst nightmare. The impact of the new minimum wage law on the growth and survival of small businesses in California will be among the items addressed at the summit. Access to capital continues to be the greatest hurdle for Latino owned businesses. The panel, "Startup Investing for the Little Guy or Gal" focuses on money, money, money. Private and public funding still eludes many entrepreneurs during the initial startup phase. The continued success of the CHCC would not be possible without corporate partners that include Southern California Edison, AT&T, DGS, Frontier Communications, and Microsoft, our newest partner. The new partnership will enable our members to access technology education through the Microsoft Community Connections Program.